The effects of overflight noise on fish, reptiles, and amphibians have been poorly studied. However, conclusions about their expected responses are based on the known physiologies and behavioral traits of these creatures (Gladwin, et al. 1988). Fish do startle in response to low-flying aircraft noise. However, they have been found to adapt to the sound of overflights. Reptiles and amphibians that respond to low frequencies and to ground vibration may be affected by noise. This includes amphibians such as spadefoots. 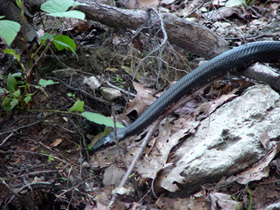 Limited information is available on the effects of short-duration noise events on reptiles. Researchers have summarized a few studies of reptile responses to noise (Dufour 1980 and Manci, et al. 1988). Some reptile species were tested under laboratory conditions. They experienced at least temporary threshold shifts or hearing loss. This was after exposure to 95 dB for several minutes. Crocodilians in general have the most highly developed hearing of all reptiles. Crocodile ears have lids that can be closed when the animal goes under water. These lids can reduce the noise intensity by 10 to 12 dB (Wever and Vernon 1957). On Homestead Air Reserve Station, Florida, two crocodilians reside in wetlands and canals along the base runway. They are the American Alligator and the Spectacled Caiman. This suggests that they can coexist with existing noise levels of an active runway. This includes DNLs of 85 dB.